NJ Skateshop is a pillar in the skateboarding community and has done more than just about any shop in the world to push skateboarding in their hometown. Chris, Steve, and NJ Skateshop now need your support in raising funds to fix their beloved skatepark. Please take the time to read a bit below about how you can help save the Sayreville Skatepark. 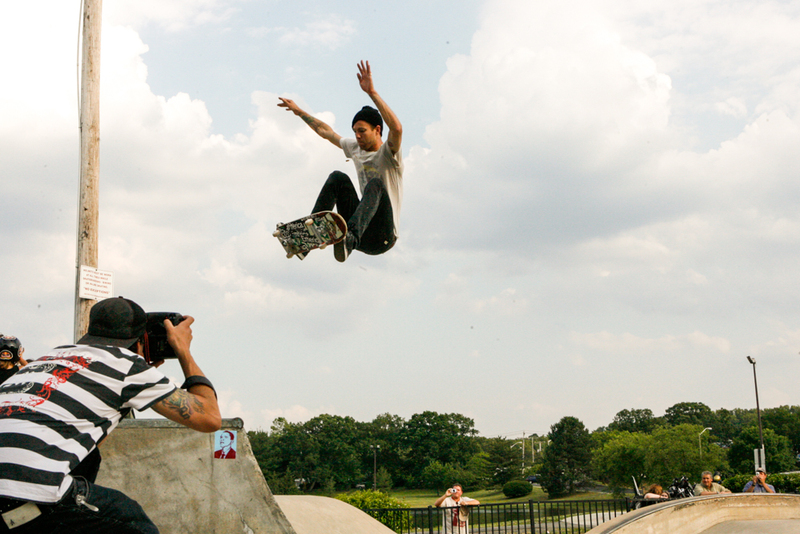 The following images were shot by Robert Brink at Sayreville Skatepark in 2008 for the now-defunct original NJ Skateshop Sayreville location. The event was an Emerica demo for the skateshop as part of their old annual Wild Ride event that ended in NYC on that year’s Go Skateboarding Day. Ex-Emerica pro Brandon Szafranski. Blunt kickflip to fakie. 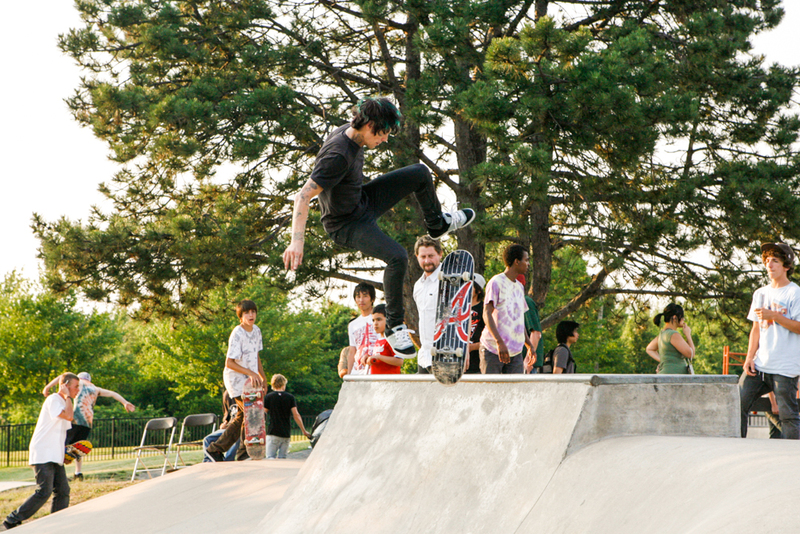 SCOTTY: Can you talk a little about the Sayreville Skatepark and what it means to you and your community? CHRIS: The deal with our current Sayreville Skatepark is that it’s actually our second Sayreville Skatepark. In the tail end of the ‘80s to ‘90s, we had a Sayreville Skatepark called Sayreville Skate Zone and it was right across the street from my grammar school that was made of wood and generally covered in Masonite, as all parks were in the ‘80s on the East Coast, so it was rough. The winters out here would just eat everything alive, so that park just got destroyed. The good thing about having that park back then and having it go away was in 2001, when the conversation started about this new era of Sayreville Skatepark. The town was already familiar with our plight and our fight. They already had gone through it once 20 years prior and they were more embracing than most other townships. 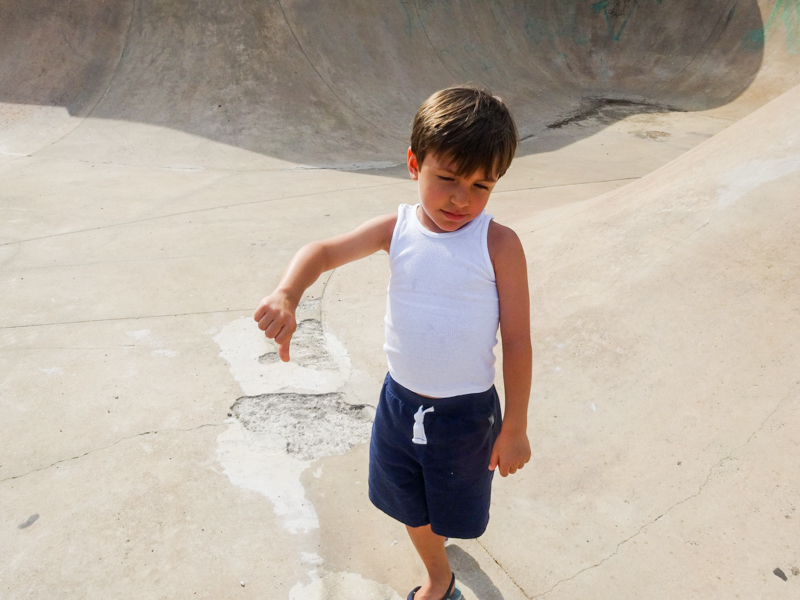 Skateboarding is part of your culture in California, [whereas] on the East Coast, in terms of the general population, it’s an annoyance and a child’s hobby. So when you see a guy my age, 40 years old, playing with a toy made for an 8 year old in the eyes of the masses, it doesn’t make any sense. It’s really weird out here. Townships do not embrace it, they don’t like it, parents aren’t into it the way they are in California. We were lucky to have that first park because it allowed the second park to get built a little easier. And really, the thanks is to a good buddy of mine I grew up skating with. His name is Troy Jankowski, and he went to every single meeting to get this cement park built and ultimately got it built in 2003. Here he is, 11 years later. He still lives in Sayreville and he is the one fighting to get our park fixed. [Troy] was able to get a bowl cement park built in 2003 when that was unheard of in New Jersey. And really, for me, just in the historical sense, the thing that’s really awesome about it for everybody is he got Wally Holiday to build the park. That’s pretty massive because Wally was in California and he came back to build it for us. But the significance for all of us is that Wally built the epic Cherry Hill Skatepark in, I believe, 1978—and if you ask any of the old timers like Dwayne Peters, Steve Olsen, Shogo Kubo—rest in peace—any of these guys loved Cherry Hill. It was epic. It was one of the first cement skate parks in New Jersey and it was the first time that guys from the West Coast were flying east. Wally Holiday built it, I mean, it had verts, like clam shells, it had weird bowls. It was ’78, it just didn’t exist out here. So for us, to get him to build Sayreville Park was huge. Justin “Figgy” Figueroa, backside tailslide. So let’s talk about what the current state of the skate park is and kind of what’s going on with it. And is there any chance that this skate park won’t get fixed? The new information that I got is that there’s no way that the town will let it go. That’s positive. If you asked me this about a week ago, I wouldn’t have a real answer for you, but there was a meeting this past Monday and everybody came out of it really happy and the town said they’re not going to bulldoze it or fill it. So that’s huge. Now it’s just a matter of when it’s going to get fixed and how much that’s going to cost everybody. The current state is that after 11 long and hard winters, the ground in the bowl is pretty banged up, the drainage is shot, it’s just what happens on the East Coast. Anything gets eaten alive. You can black top a road and you’re going to black top it again in a couple years because winters out here just destroy. That’s what they do. There’s no drainage right now [at Sayreville], there’s pipes bursting. Basically the bowl is broken up at the bottom and [needs] a new drain system. A few local guys tried to patch it up themselves but it probably created a bigger problem than it is. [laughs] I’m sure. So right now is it currently skateable? Or is it not skatable? I don’t think it’s skateable by the township’s allowance or even if you wanted to attempt it. There’s water at the bottom, there’s nowhere for the water to go—a mess. I took my five year old over there about two weeks ago because he’s just starting to get a feel for it. He loves transitions, so I just hold him and and boost him up in the fakey rocks and I couldn’t even get to a transition spot because it’s all banged up. What the skate park looks like currently. Shot by Chris. Yeah, but there’s a line from [Bruce] Springsteen’s Atlantic City, “Everything dies but maybe someday it all comes back.” And that’s what we’re hoping. It’s pretty shot but I think it’s just a matter of diligence and working on it and trying to raise some cash. We made these really silly shirts and I don’t know if you saw them. You know the Slayer Hell Awaits cover? We just redid those and since the town is called Sayreville, we always call it Slayerville. It’s got a landfill in our town so we redid it and did these “Smell Awaits” shirts because our town always smells like a landfill. It’s ridiculous, I’ll show you. But we’re raising money with that, we’re raising money with the GoFundMe, and honestly, the amount of money we raised in such a short amount of time has caught the eyes and ears of the councilmen of the town. We’re not talking about 2 dollar car washes anymore. This is the Internet. People can get together and organize and they can really revolutionize certain situations. After seeing you guys take it upon yourselves and taking the initiative, the city has really gotten behind what you’re doing. The city seems to understand the importance of having a skate park in the community and having that outlet for the youth in the community as well. Marisa Del Santo (left) is the only female to have ever ridden for the Emerica team and one of the most talented female skaters in history. Enjoying some ice cream truck treats at Sayreville Skatepark in 2008 while other Emerica pros and fans take a breather. But you also know that in true skateboarder fashion, you can do it yourselves. Yeah, and we will get it done. They’re really good about it, they’re realizing, Hey, displaced or not with their homes, the skateboarders that skate there are of this town. As much as people need help in those areas, they also need escapism too. Lastly, what does the skate park mean to you and what does it mean to the area? Obviously the skate park is really important and it’s important to you and your shops and your family and friends. Can you talk a little about that? The importance of this park is… multi-layered. In 2003, when it was built, there weren’t really cement parks so people were coming all over. We had people stopping in from Minneapolis on their way to New York City. People from Carolina. Just all these people popping in to check out the park. 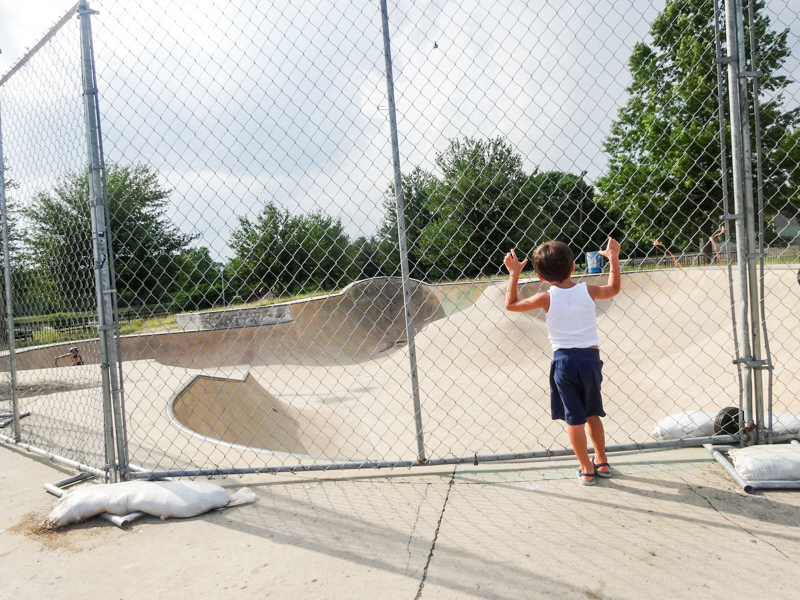 Now cement parks are pretty commonplace, but this one meant a lot to a lot of the people in the area because it was the only one of its kind and there aren’t that many good bowl parks in our area still to this day. It’s right across the street from a high school. Kids would get out of school, go down there to hang out, and skate. Our township—for whatever reason, it doesn’t even make sense—but every other generation, for some reason in that town, there’s a heroin problem. I’ve lost a lot of friends over the years, other people have lost friends, that town has just got a weird history with heroin. And skateboarding has done a great job over the last 11 years—by having that park in that town to keep off junk, to keep them off drugs, and give them a place to skate and hangout and not be problematic. Aside from a bunch of old guys that really want to skate a bowl and have a place to go, there’s also a bunch of young guys that want to have an escape from maybe from a rough home life, escape from some friends that do a lot of drugs, and they just want to have something for themselves. That park has saved a lot of lives in the past 11 years. So aside from whatever great significance it has for me and my buddies, it saves a lot of kids. Skateboarding has the power to save lives and this park has been really helpful. Saints and Sinners – NJ Skateshop Demo from Chris Phillips on Vimeo. What have been some of your favorite moments at the park, maybe your favorite person to watch skate it or best tricks you’ve seen go down? When Saints and Sinners—that Creature Santa Cruz—came through, that was unreal. Because normally, we get demos that stick to the street course and that demo was 100% in the bowl. It was a time that it fully got serviced. That entire demo was shot in a bowl, and those guys killed it. Navs [Darren Naverette] was there, [Justin] Strubing—just so many dudes. There’s been so many guys but that one for sure. Even before it was finished, I happened to be doing an East Coast Globe trip with Al Partanen, and [Greg] Lutzka, and a couple other dudes. It was probably the beginning of 2003, so they had already poured a lot of the concrete but the hadn’t finished it so there was no way to get to the over vert, yet Partanen found a way to get to the over vert and do a front blunt. That was probably the coolest because it was the first mark on the darn thing. Guys were still in the background building it. There’s been just so many amazing dudes that have come through and skateboarding has been really supportive of us and of that park. So there’s no way we were just going to let it go away. And I’m glad with the efforts from GoFundMe that it got the attention of the town and the have no desire to let it go away either. Jon Miner (Emerica filmer) and Jerry Hsu. If you want to support the Sayreville Skatepark, you can buy a SLAYERVILLE “SMELL AWAITS” shirt here or you can donate to their GoFundMe. Every dollar helps.